New Page Books, 9781601633637, 288pp. Usually, you perceive the world by using your five senses: sight, taste, smell, touch, and hearing. But there is a sixth sense, an inner eye that can open the gateway to subtler realms of existence. Developing this inner eye will enable you to view a previously invisible world of multiple dimensions, spiritual planes filled with light, and alternate realities of indescribable wonders. This eye of wisdom, knowledge, illumination, and intuition is aptly named the third eye. Using the methods in Awaken Your Third Eye, you will learn how to develop supersensory perception, and how to use your third eye in your everyday life to receive guidance, healing, wisdom, inspiration, creativity, and spiritual awakening. Susan Shumsky, DD, is an acclaimed spiritual teacher, award-winning author, retreat leader, tour guide to sacred destinations, author of more than a dozen books, and founder of Divine Revelation—a unique technology for clearly hearing and testing your intuition. Visit her at www.divinerevelation.org. 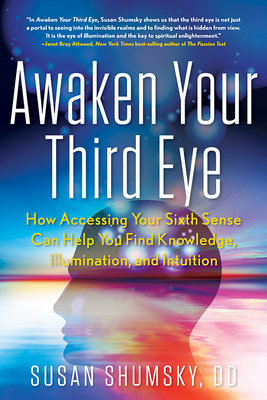 "Awaken Your Third Eye is a practical guide to help you explore the depths of your intuitive wisdom." "In Awaken Your Third Eye, Susan Shumsky shows us that the third eye is not just a portal to seeing into the invisible realms and to finding what is hidden from view. It is the eye of illumination and the key to spiritual enlightenment." "Susan's book empowers you to break through the main physic knots and release the energy that awakens the third eye. Her book provides a powerful technique to reconnect to the domain of divine grace that dwells within you." "Susan Shumsky has practiced meditation and other spiritual disciplines for more than 48 years. She spent 22 years under the tutelage of an enlightened spiritual master from India. She isn't just a writer. She is a master teacher and has experienced everything she describes in this book."